Distant/Remote Dowsing needs no further explanation. The term ‘remanence’, however, might not be familiar to readers. To quote from the ‘BSD EEG An Encyclopaedia of Terms’, remanence is ‘the imprint of energy that remains long after an object has been moved’. I believe remanence is what led to the discovery of the National Pattern of Dowsable Alignments published in ‘Dowsing Today’ (Volume 39, No 269, September 2000, p.8 entitled ‘Evidence for Prehistoric Mapping by Equilateral Triangulation’). Subsequent questions about what lies at the Aldbourne/Baydon intersection prompted me to write this article. The first map illustrates the general arrangement. This includes the three sites which I first realised formed an equilateral triangle. Admittedly, other preliminary methods might have led to their discovery but perhaps in the fullness of time remanence may take its place alongside the more commonly known methods of archaeological investigation, namely aerial photography, crop marks, geophysics and ground radar. The map shows how the Beltane sunrise aligns Four Barrows and Woodsend to Avebury Stone Circle, while Black Gate to Four Barrows produced continues on to Windmill Hill at Avebury. This latter should not be confused with Windmill Hill at Aldbourne, which is shown on the second map. Other named features locate the geometric pattern within the village. Moly was (I believe) a substantial mound but the bulk of the material used in its construction has been subsequently rearranged into a necklace dam on the sloping downland to retain water, thus creating a dewpond. The intricacy of the village pattern of energy lines, plus the Down’s Hexagon, soon led to the discovery of the line parallel to (and to the north of) Black Gate/Apex which when produced northwest (after leaving the prominent Charlebury Hill) lines up with the hilltop at Cricklade. I therefore originally suggested one actual base triangle for prehistoric man’s countrywide map involves Black Gate, Cricklade and the White House at Cherhill. Eight equilateral triangles of this size (side approximately 15 miles) would cover the linear distance between Bristol and London, where a tumulus remains immediately south of the Old Greenwich Observatory. At any period in history it would have been feasible for surveyors to lay out adjacent equilateral triangles ‘in the field’ and subsequently draw the same pattern as a map. This has the advantage that no measurement requirements would be needed, as the proportions would be correct. One method may have been to lay out an accurate stone hexagon on a hilltop. First the ‘cartographers’ would have marked a central point with a staff. A second staff joined to the first with a leather thong held taut would then have been positioned in their chosen direction. Having marked this point, the second staff would then have been used to prescribe a complete circle with ‘length of thong radius’ around the first staff. Both staves would have been used to step out the hexagon around the circle (using the thong to make the six arc strikes). The Long Man at Wilmington in Sussex is carrying two staves. Does he, as has been suggested by Alfred Watkins, represent a prehistoric surveyor? The central question is, could an accurate map be made by using early man’s equivalent of dividers, pencil and paper? Was this what was done? A substantial forked twig could work as a pair of dividers. Charcoal would have been too inaccurate as writing material, but thorn points scratched in clay tablets or used on vellum with berry-stain ink would have been perfectly satisfactory. They might have used salt as a mordant to fix their ink. When all this happened is open to speculation, but development probably took place over many generations. There being four barrows at Four Barrows makes one wonder whether these represent four attempts by early man at reaching near-perfection for their first map triangle or whether they are evidence of improvements by subsequent generations. On such a map it would, of course, have been necessary for its readers to find their way accurately. How would the cartographers have identified each individual triangle? Just as we nowadays are accustomed to identifying squares on an Ordnance Survey map by its grid references, I propose that early man used symbols for monuments within that triangle to identify each map triangle. To illustrate their map it is possible that two concentric circles in one of the triangles could indicate Stonehenge, while a circle containing two smaller circles (one above the other) could represent Avebury. Aldbourne’s central pond circle has two smaller satellite circles (one to the northwest and the other to the east) while the stylised White Horses such as at Uffington and Westbury might also have been ‘signposts’. The Long Man at Wilmington occupies a prominent position and to this day is a significant landmark. In conclusion, I believe patterns of energy lines are worth recording around obvious sacred sites where as a minimum at least some earthworks still exist. Discovering similar patterns ‘in the middle of nowhere’ might then be instrumental in locating formerly unknown important landscape sites. Dowsing individual dwellings (often for geopathic stress zones and appropriate action) is a rewarding experience if only as social interaction. It was because I undertook such work in Aldbourne that the village’s secrets came to reveal themselves. 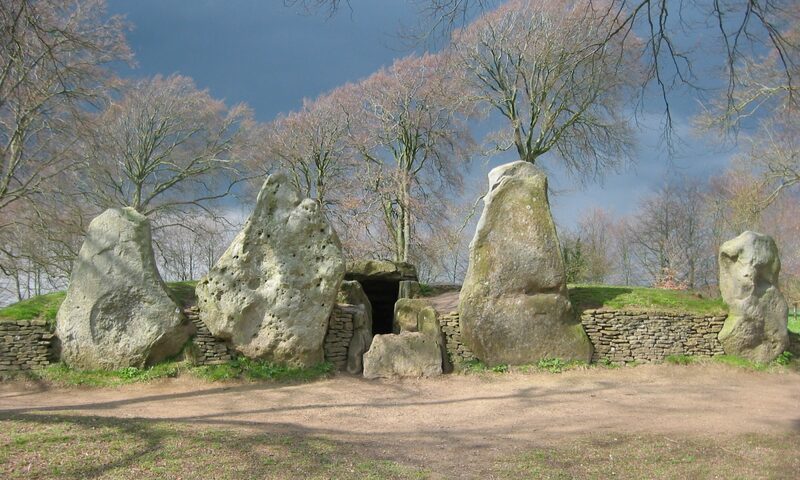 I believe that in due course an underground chamber similar to Royston Cave will be discovered in the vicinity, and this will probably contain some confirmation of prehistoric man’s mapping triangulation.